This EKG comes courtesy of Dr. Litvak and Dr. Calabro. A 59 y/o male with no significant past medical history presented to the ED complaining of weakness and shortness of breath. He had been fatigued for several weeks. He presents drowsy. V/S: Pulse 120, Respirations 28, BP 180/90. What does the EKG demonstrate? 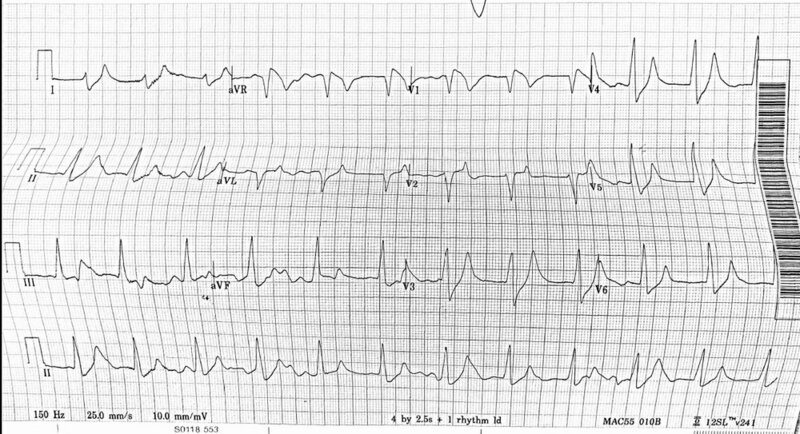 The EKG shows a wide QRS complex with an irregular rhythm. This EKG is concerning for hyperkalemia. This patient’s Potassium was 9.9. He was treated with calcium, insulin, glucose, albuterol, bicarb and emergent dialysis. This patient was given calcium. The repeat EKG below shows some improvement in the rhythm but the QRS remained wide. The patient was found to have AKI with BUN 225 and Cr 25. Blood gas showed pH 6.95, pCO2 16, HCO3 4. A foley was placed and the patient was anuric. The patient was sent for emergent dialysis. After dialysis the EKG (below) shows a normal sinus rhythm with a narrow QRS complex.